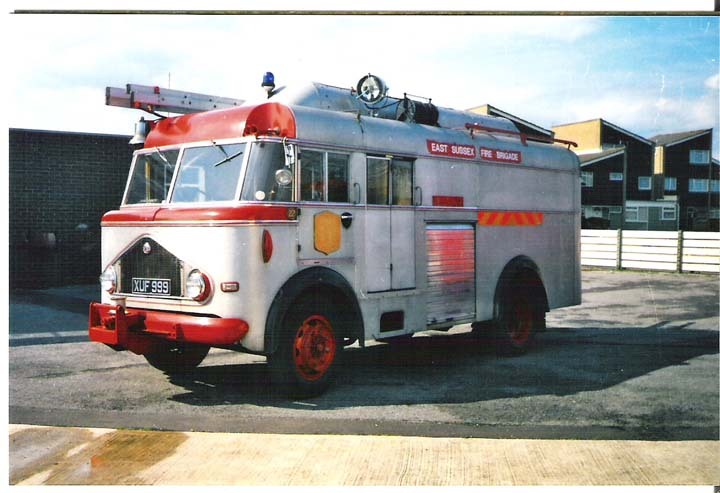 Fire Engines Photos - 1956 Bedford Emergency Tender(XUF 999). 1956 Bedford Emergency Tender(XUF 999). 1956 Bedford Emergency Tender(XUF 999).This appliance was used by the old Brighton Fire Brigade as an Emergency Tender up until the amalgamation with the East Sussex Fire Brigade in 1974.After emalgamation it was re-equiped and turned into a breathing apparatus tender remaining at Brighton until going out of service and into presevation during the mid 1970's having given twenty years service with the Brighton Fire Brigade,and then East Sussex Fire Brigade. As demonstrated by this picture, Bedford were the best! This machine is perfect! i'm just wondering how many Volvo's will give 20 years service, North Yorks have all suffered from chassis rot and been withdrawn before getting 20 years service under their belts, so much for these modern appliances been better! Added by John Johnstone on 10 March 2008. Great photo Pete, not perhaps the prettiest appliance but a very useful machine I bet. Did it have a door in the rear to get inside and is the raised part on the roof to give head room inside ?.keep the old Bedfords coming. Added by Paul Warnock on 10 March 2008. Paul, if I remember, I think you could enter the back from the cab, thats why the roof is raised and extends over the cab to allow personnel to stand and enter from the front of appliance, and yes I'm sure the back door was simular to the rear cab door so personnel could enter from the back of the appliance. Added by Pete Matten on 10 March 2008.
these old fire engines look so good reminds me of my time in the brigade. Added by Malcolm Punter on 05 December 2008. Added by Bill Lynch on 01 January 2009. Neither - it was a Miles body. Added by Ian Moore on 01 January 2009.
by Miles, this appliance though was sprayed all over red.A real classic. Fire Brigades old emergency tender which I mentioned above(reg-152 DUP). The appliance is somewhat the same(picture #14669), but allover red livery. Sunderland had one too. This Miles bodywork incorporated their own front cowl, unlike their earlier Bedfords, which used the standard lorry cowl like the Green Goddesses. Added by Rob Johnson on 16 December 2017. There were two Miles ETs with conventional Bedford S type fronts: East Ham and Swansea and 3 Commers- at Barnsley, Bootle and Newport. Added by Ronald422@btinternet.com on 20 December 2017.